Klazz Brothers & Cuba Percussion. KUCHING: Multiple award-winning Klazz Brothers & Cuba Percussion breathes new life into concert halls all over the world. Classics of musical history are revived through witty arrangements in an astonishing guise of sounds, seducing the audience into a world of passion and contagious Cuban joy of living. With their distinct and unique sound, the ensemble’s unconventional musical language unveils refreshing insight into the works of Bach, Mozart, Paganini or Brahms; uniting the classical European music tradition with swing, merengue or AfroCuban jazz in a truly unique way. The various classical themes, brilliantly arranged as salsa, bolero or chachacha are characterised by rhythmic as well as melodic diversity with abundant space for improvisation. Music lovers of all generations and genres including jazz, salsa and classical, have been fascinated by the Klazz Brothers & Cuba Percussion’s experience. 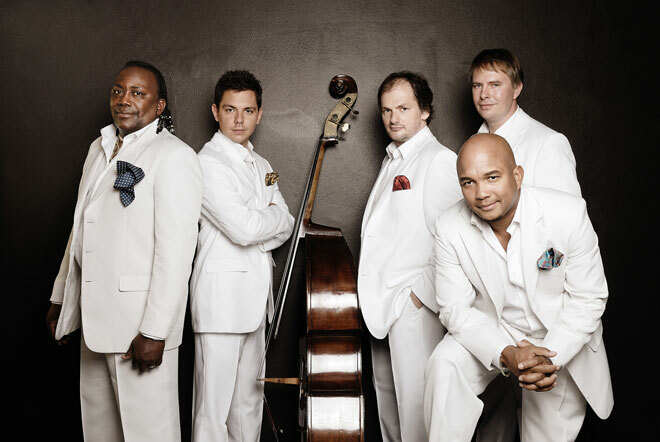 The Klazz Brothers, also known as the “masters of classical crossover”, sold more than 500,000 albums worldwide and received the Echo Klassik and Jazz Award twice within the last years. The Klazz Brothers were also nominated for a Grammy for their albums- Classic meets Cuba, Jazz meets Cuba, and Mozart meets Cuba. Their music can be heard in Hollywood blockbusters like “Collateral” with Tom Cruise or ‘Hitch’ starring Will Smith. Other programmes include: “Symphonic Salsa” (performed with a large symphony orchestra), “Messiah Superstar” (with choir, big band and soloists) as well as “Chopin Lounge” (as a trio). The Klazz Brothers have been reaching and continue to reach and inspire, a steadily growing audience for more than 13 years. They will be performing at the Borneo Jazz Festival in May. Besides Klazz Brothers, the seven confirmed bands are Raw Earth from Singapore, API from Malaysia/India, O Sister! from Spain, Funkatorie from Malaysia, Yuichiro Tokuda from Japan, Manou Gallo Groove Orchestra from Ivory Coast/Belgium and the Rad Trads from New York, USA. Special tickets promotion for Borneo Jazz will be available at the Miri Country Music Festival on February 27 at ParkCity Everly Hotel. Every purchase of three tickets, the festival goers will be entitled to one free ticket. Early bird price for a one-day entrance ticket is at RM60 for an adult and RM30 for children age seven to 12 years old while the two-day entrance is priced at RM100 for an adult and RM40 for a child. The last day to purchase Early Bird tickets via online will be on February 29. Family package of two adults and two children is also available at RM120 and purchases can be made online via the festival website at www.jazzborneo.com. The two-day annual festival of Jazz music will be from May 13 till May 14 at the ParkCity Everly Hotel in Miri and will be featuring some top line ups rendering a wide range of world-wide jazz genre.